A Functional Capacity Evaluations (FCE) is a process of measuring, recording, and analysing an individual’s ability to perform purposeful activities in response to broadly defined work demands, activities of daily living, or projected vocational status required. A FCE uses a systematic series of physical examinations performed by an authorised Physiotherapist or Occupational Therapist. FCE’s are commonly used for return to work purposes after a compensable injury to determine the capacity of a client to return to work duties. A FCE may also be used for other medico-legal purposes. The WorkHab FCE is used by Core Physiotherapy and Pilates Studio because of the benefits in assessing “capacity profiling” incorporating physiological performance, standardised testing procedures, and clinical objectiveness, while allowing the assessed individual to perform activities in a safe situation. A FCE can be requested by an individual’s Lawyer, General Practitioner, Rehabilitation Coordinatior, or Case Manager. A FCE can take between 2 to 3 hours to complete. A FCE requires an individual to perform various activities. Some of these activities will be easy for an individual to perform, other activities will require an individual to perform at their maximum attainable effort. Therefore, please ensure you bring appropriate clothing for exercise, water bottle, snack, and something to read during the rest phase between different tests. A FCE is tailored specific to an individual’s personal activity level, and the requirements of their specific occupation. Before a FCE begins testing an individual’s capacity, baseline measurements are taken including heart rate and blood pressure, in addition to specific screening questions to ensure the health of the individual will not be compromised. 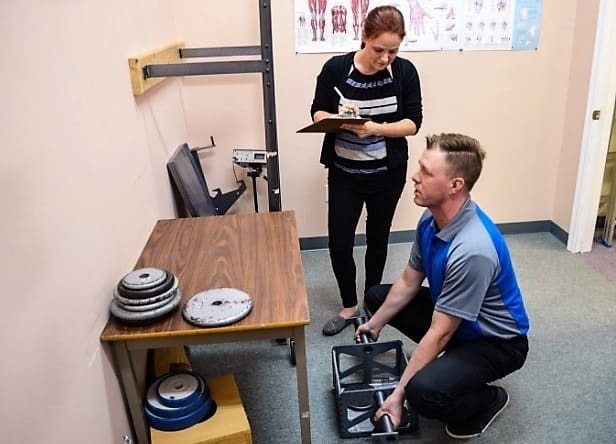 Following the baseline testing, measurement of range of movement testing is performed, followed by postural activities, manual handling activities, dynamic activities, and functional activities. A FCE measures an individual’s capacity to perform a variety of tasks. Units of time and capacity to lift certain weights are measured quantitatively. The individual will also be requested information regarding any pain or discomfort with the test, and their perceived rate of exertion with the test. The test will also be scored according to the individual’s stance, posture, torque, leverage, pace and timing with the task.